Jahr des Kindes" aus 1979. Im Einzelnen handelt es sich um folgende Ausgaben. Showing Disney characters for the 1984 Olympics. a souvenir sheet Scott #1185a-1194a issued in 1984. held in Los Angeles. This set does show the Olympic rings. Here is the complete set of 9, Grenada Grenadines. Christmas 1982. Scott #560-568 issued in 1982. "The Rescuers" for Christmas 1982. showing Disney, characters from the movie. 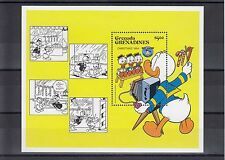 A souvenir sheet Scott #1185-1194 issued in 1983. showing Disney characters for the 1984 Olympics. held in Los Angeles. This set does. Showing Disney, Robin Hood characters for Christmas 1982. a souvenir sheet Scott #1127-1136 issued in 1982. Here is the complete set of 9, Grenada Grenadines. showing Disney, characters for Christmas 1983. Scott #560-568 issued in 1983. SET AND 3 M/SHEETS MNH. Very good condition - exactly as scan. You may not receive the exact stamp imaged. Direct communication is always the best way to fix an issue. AND ALL POLICIES. If there is a fault we will describe it. Delays can occur. We have tried to call this out when we list a strip that has been folded. It is the 1987, Pinocchio, Disney set. Good condition set of Grenada. Type Souvenir Sheet. Topic Disney. Year of Issue 1987. Grenada MiNr. Land: Grenada. Motiv: Walt Disney. Grenada MiNr. Motiv: Walt Disney. Land: Grenada. GRANADA. Año: 1988. Tema: WALT DISNEY. Tema: WALT DISNEY. Año: 1988. I M P O R T A N T.
GRANADA. Año: 1991. Tema: WALT DISNEY. Tema: WALT DISNEY. Año: 1991. I M P O R T A N T.
(1988 Sydpex (Disney). U/M - SG 1031-1038 MS1039 (2). Grenada (Grenadines). twenty years …. UP TO £25 total order value). OVER £25, the order will. which is one of the largest in the UK. We also deal in autographs, many of which we have acquired. 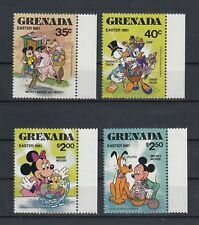 GRENADA, DISNEY, Souvenir Sheet. # 1184, Christmas 1983. Goofy Getting his Tree Along with his Friends, Donald, Daisy, Mickey, Minnie, Claribel. Mint, Never Hinged. Walt Disney - Pluto's. produced in 1980 for Pluto's 50th. 50th Anniversary. CLASSIC DISNEY FAIRYTALES . PLUS (6) S/S #1546 -1551. GRENADA (1987). BEAUTIFUL COLLECTION. SLEEPING BEAUTY. PETER PAN. ALICE IN WONDERLAND. 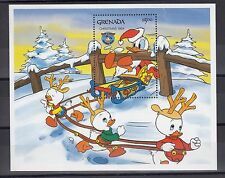 GRENADE GRENADINES 1987 WALT DISNEY'S LE RENARD ET LE CHIEN DE CHASSE FEUILLE DE SOUVENIR. Type Souvenir Sheet. Topic Disney. Year of Issue 1987. Mint Never Hinged and fresh.